This 100% Real Sheepskin Cover is Made in the USA and is super soft and plush, creating a soft, comfortable surface on your existing seat. Great for riders that have irritation or chaffing issues when riding. Very happy with purchase of sheepskin cover. Excellent fit, very comfortable. Makes it easier to use cycle to hellp with rehab of hip replacement. Great service and all questions answered promptly. Thank you very much. Fits exactly like it is supposed to and fills the bill. Thanks. I got my 12" sheepskin bicycle seat about two weeks ago and put it on. Have been riding about 12 miles a day and it is great. When it is cold out the seat is warm and no sliding off the vinyl seat that is underneath. 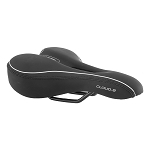 Provides great comfort. I am very happy with my new seat cover! 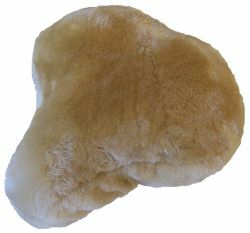 This is authentic sheepskin which I use on top of the large gel pad which I also purchased. I'm using both items on my FitDesk which is a stationary bicycle with a desktop. The sheepskin atop the gel pad make it possible for me to sit and peddle for longer than an hour in comfort. High quality. Quick shipping, albeit a little on the expensive side. I would not hesitate to purchase from this company again. The products exceed expectations. 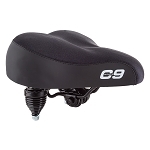 This is pretty nice, it isn't the best fit on my bike seat, but it works, just hard to get on. I have a new Schwinn Airdyn, so the seat is large. Other than than it is good. 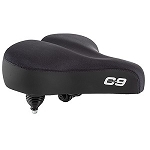 Great purchase -- 12" fits generously around 11" seat that already had a thin cover on it. Doesn't shift. Very comfortable. Other bikers are envious. I found your cover to be very well made and comfortable. When I got well into my "ride" I did find some slipping which required stopping and adjusting it. To correct that I punched 6 holes[front, middle & back] along the edges with metal eyes to run tie strings through and hold the seat cover in place. Works fine now. Hard to stretch over the seat but comfortable.